When’s the last time an outfeed roller fell over while using your table saw? As the board is teetering off the back of your saw, you find yourself wishing you’d already built an outfeed table. If this has ever been you, stick around to see how I built one that will handle large projects with ease. I have plans available for this project along with a full video tutorial below. 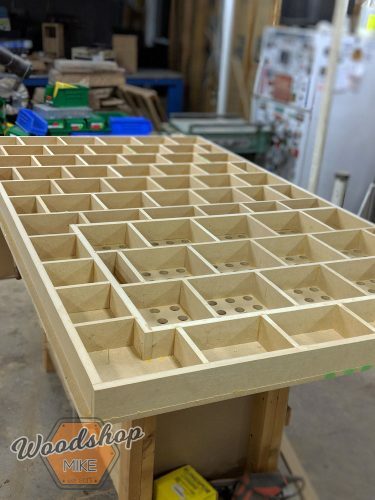 This project is constructed mainly of MDF and plywood using various joinery methods, but you could adapt the project as use just about any joinery method you’re familiar with. 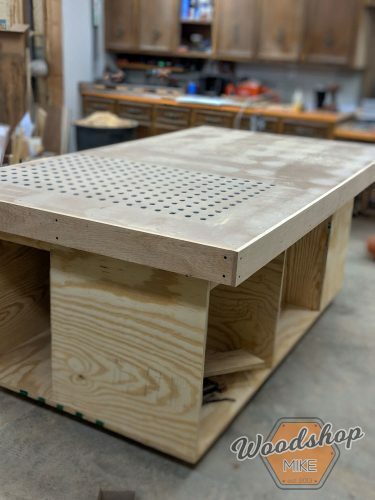 I started by knocking out the holes for the downdraft sanding portion of this table, which was hands down the single most time-consuming step. After this, the rest of the build is pretty quick! 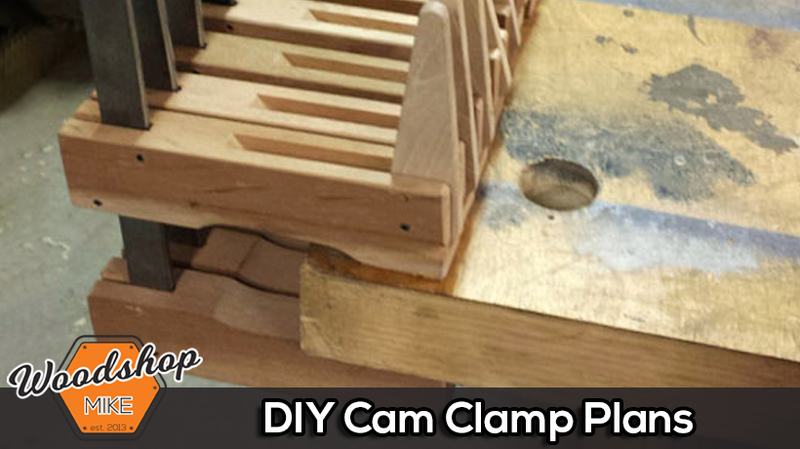 I clamped two sheets of 1/2″ MDF together with one sheet of hardboard in between. At this point, all of these sheets are still 4′ x 8′ and will be cut down later. With my template made and the three sheets securely clamped together, it’s time to get started. I first mark out a grid for hole placement which is used to position my template. I recommend your favorite tunes to keep you company while you commence drilling and routing 216 holes. I screw the template in place for each row and then drill out the center with a 3/4″ spade bit. After vacuuming up all the chips, it’s time to break out the router and flush cut each hole. After I finish the row, I hit it with the vacuum and go back with the router for a cleanup pass. This is to make sure the dust that invariably got on the template doesn’t make the holes too small for your PVC conduit to fit. After this second pass, vacuum and test the size of each hole with a short section of PVC. This ensures that the pieces will fit. If the fit is too snug, hit it again and make sure everything is ok before removing the template. 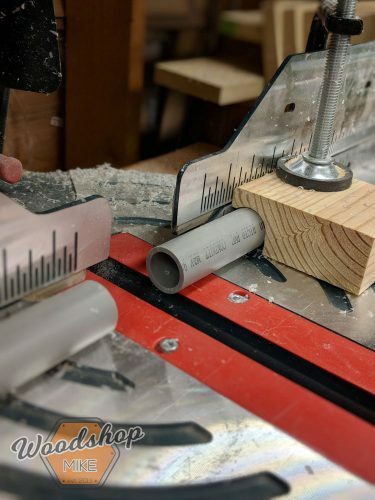 If you have a router bit long enough (1-3/4″ long) to cut through every sheet in one go, then you’re done! 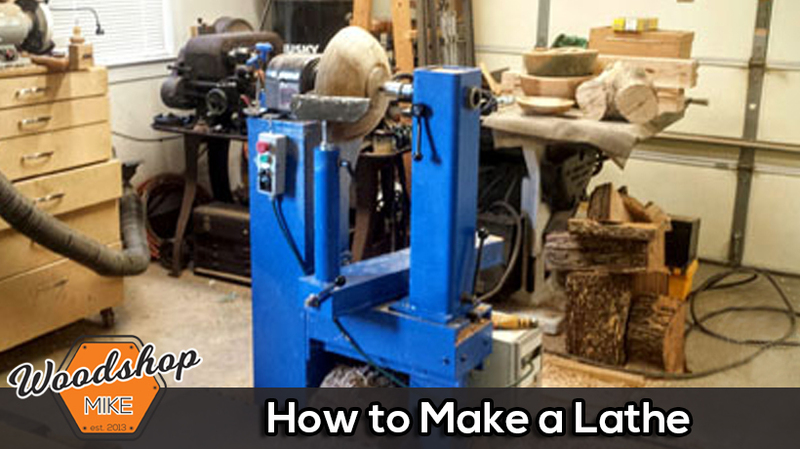 If not, just repeat the process to cut all the way through the stack of material. After all the pieces have been cut (except TB-11), it’s time to start assembling the internal grid with glue and brads. I left one sheet of MDF on the bench to use as a reference while assembling the grid around the hole pattern. 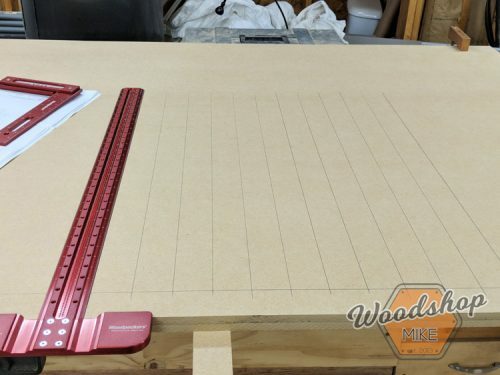 If you orient this sheet like the top of your table is facing down, you’ll save yourself a little time when you’re ready to add the hardboard. If not, don’t sweat it. Starting at the corner closest to my array of holes, I align one long side and one short side of the grid per the layout in my plans. I glue, check for square, clamp, and brad these two pieces together. I follow this procedure around the perimeter and then clamp the pieces in place to prevent the frame from shifting while the intermediate pieces are added. Following the grid layout in my plans, I accurately installed the internal pieces. You can start on either end, but I started on the end without the hole pattern. To make things a little easier, I used two of the short pieces as a spacer while the long pieces are glued and nailed into position. 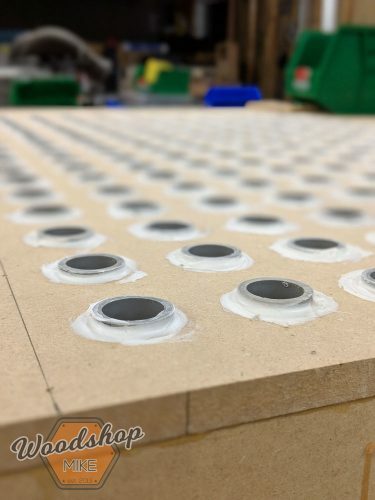 Once all six of the 44-1/2″ pieces are in place with the 7″ spaces in between, I frame out the section around the hole array following the same procedure. Cut the TB-11 pieces to fit and install. 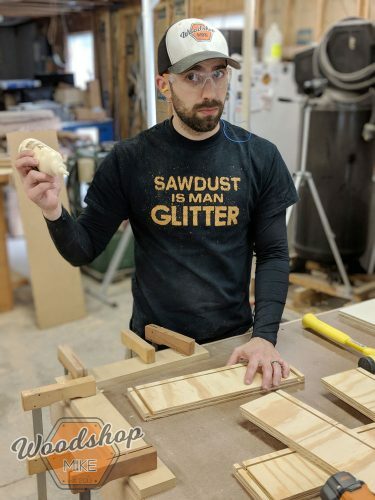 You’re now ready to add the layers of MDF to the top and bottom. Check all the joints in the grid and level out any areas that aren’t even. Now, run glue along the top of all the grid pieces and get someone to help put the top sheet in place. 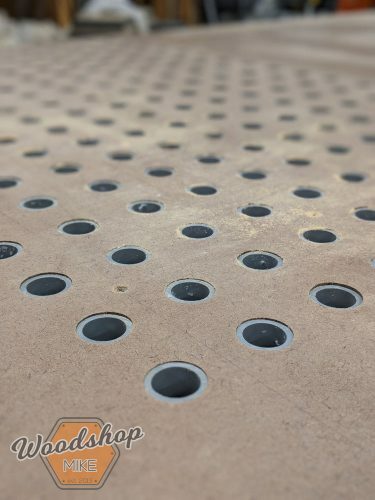 Make sure you line up the holes with the correct area of your grid and that no grid pieces are covering any of the holes. Clamp the top down in a few spots and use a large t-square to mark the position of the long internal grid pieces. Secure the sheet along the edge and internal grid pieces with a brad nailer about every 6″. I let the glue set up for about 45 minutes before flipping the assembly over. Repeat the same leveling and gluing procedure for this side. Once the next sheet is in place, use two pieces of PVC to align the top and bottom MDF sheets. 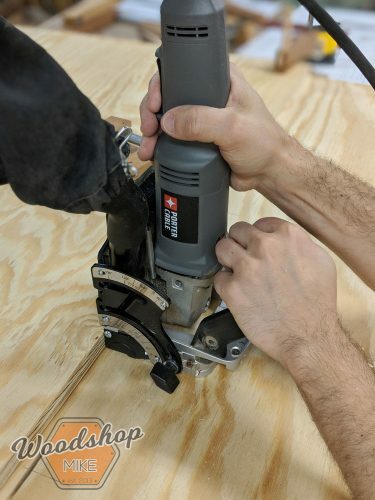 With the PVC in place, clamp around the edges, layout your lines, and get back at it with the brad nailer. At this point, you’re ready to add the hardboard. 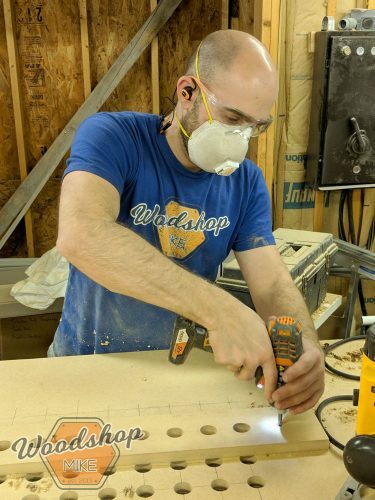 Depending on how your bench top is oriented, you may have to flip it one more time to have the top facing up. 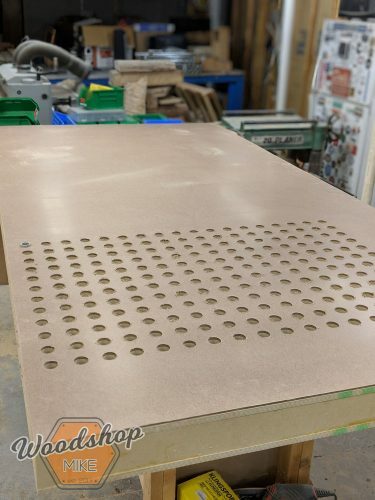 Clean up any fuzz that may be on the hardboard around the holes with a 150 or 220 grit disc in your sander. Lay your hardboard sheet down with the smooth side up and use the two pieces of PVC conduit to locate it accurately on the bench top. Now you’re ready to secure this with some #8 x 1-14″ screws into countersunk holes spaced 8″-10″ apart. The last step is to cut down the excess material on the top and bottom. I broke out my circular saw and just eyeballed the line. Since I was going to come back later with a flush trim bit in my router, I wasn’t too worried about making things perfect at this point. 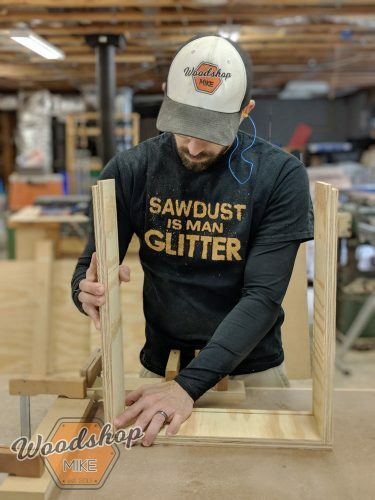 Grab your bundle of PVC and head over to the miter saw. 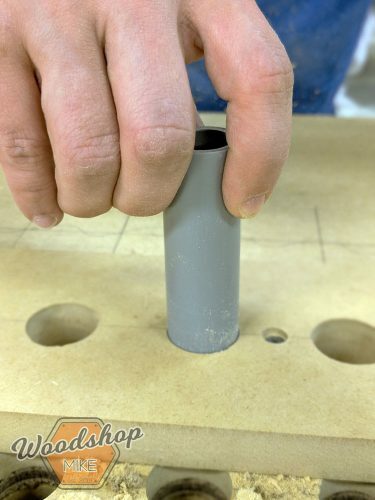 Make a simple stop block like the one shown below by drilling a 1-1/16″ hole about 1/2″ deep. Knock off the excess material and set it so your finished pieces are about 4-1/16″ long. Just a quick fun fact…If you don’t use a hold down (or make the block I described) the piece will roll once the cut is finished and catch on the blade…which is not good. Flip your tabletop over so the top is facing down and the holes are accessible from below. Slide the PVC into place and leave it just shy of the hardboard top. I used construction adhesive that works with PVC to secure the conduit. 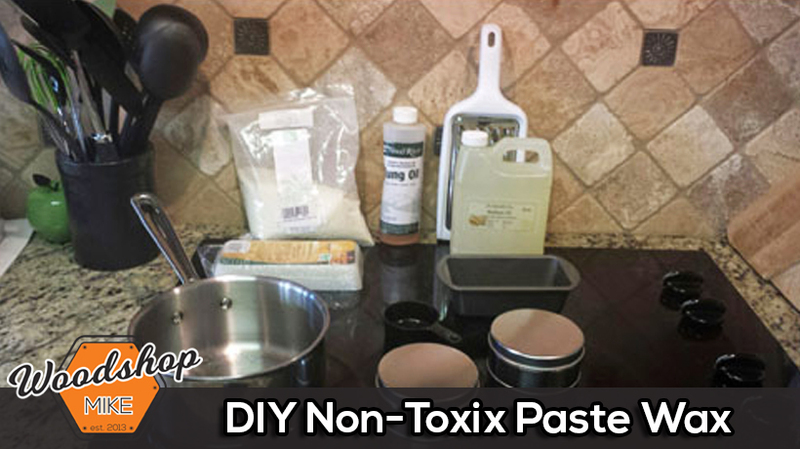 This step is completely optional, but it will help improve the durability of your work surface. Since this is shop furniture, I used white oak milled to 1/2″ thick and opted to go through the process of working from rough stock. You certainly have the option to buy boards that are already to thickness from Home Depot while you’re getting all your sheets goods if this is a step you’d like to speed up. 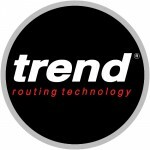 Cut the trim to length and install it on the short ends of your benchtop first. I used glue and brads to tack the trim in place and then followed up with #8 x 1-1/4″ screws in countersunk holes to finish it off. I used two screws about every 12″. With the short sides on, you can cut and install the long trim next using the same method. Chamfer the top edge and sand to at least 120. 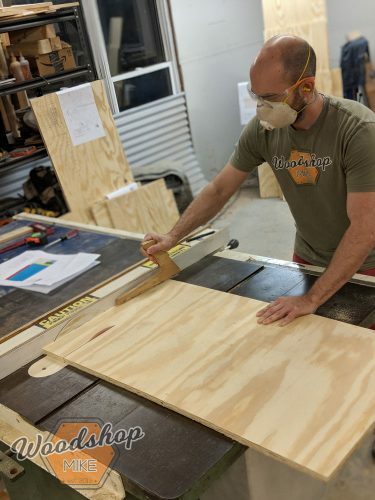 Throw a couple coats of your favorite finish on the hardboard top and trim to make glue cleanup a little easier and you’re done with the torsion box! 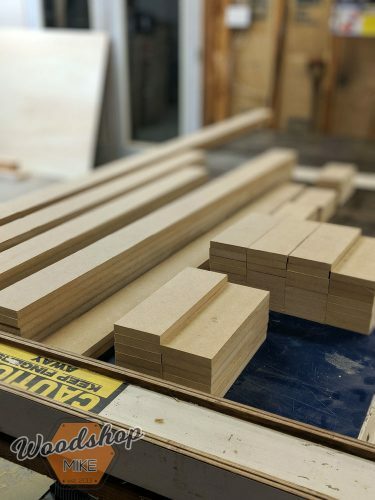 I started off by cutting all the pieces for the cabinet from my stack of plywood using the circular saw, table saw, and jigsaw. Next up was laying out and cutting all of the joinery. If you have a biscuit joiner, then follow the plans for laying out all the joinery. For all of you biscuit joiner folks, follow the sequence in my plans for assembling the case. Using a few clamps to hold things in place, each piece is assembled with biscuits, glue, and brads. Start by putting a bit of glue in each biscuit slot of the two pieces that are being assembled. Put one biscuit in each slot on one of the two pieces. 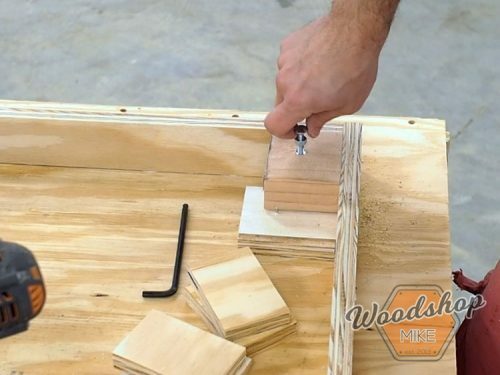 Bring the two pieces together with a mallet, your fist, or clamps, and shoot a few brads into the joint to hold things while the glue dries. If you prefer using pocket holes, then this is a simple modification. Ignore all of the layout lines on the face of each piece. Do add pocket holes on all edges of pieces that are marked for biscuit joints. 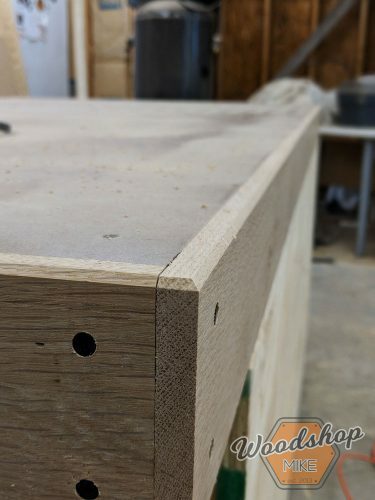 I’ll eventually release a second set of plans that is specific to pocket hole joinery, but until then, don’t hesitate to ask questions! For simplicity, follow the same assembly sequence that’s outlined in the plans and you’re done! Cut out the pieces for the toe-kick per the cut sheet and head over to the cabinet. 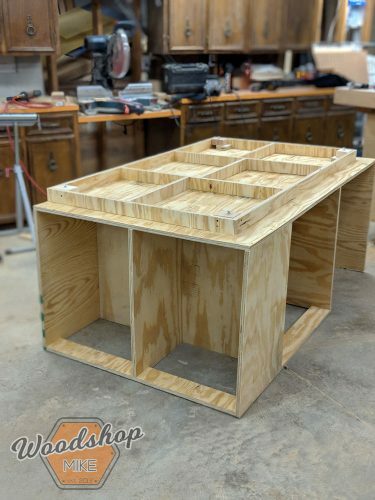 Flip the cabinet frame over and layout the pieces per the toe-kick layout in my plans. Using glue and brads, the assembly method of the toe-kick is identical to the torsion box grid. With the toe-kick put together, it’s time to secure it to the base. You could go about this a few different ways, but here’s what I did. 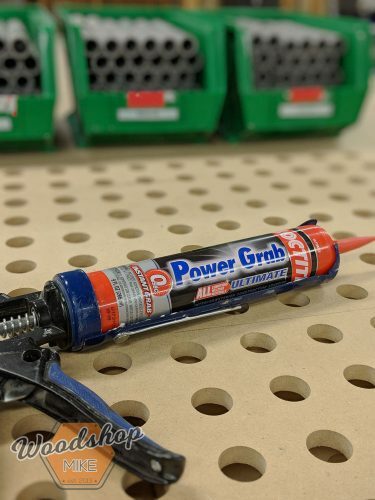 Grab your tube of construction adhesive and run a bead along the top of all the toe-kick pieces. Flip it over and center it on the bottom of the cabinet with one long edge against the back of the cabinet. Shoot brads from inside the cabinet into the toe-kick to secure it while the glue cures. This method is plenty strong, and within 20 minutes, I had the cabinet flipped back over without any issues of the toe-kick shifting. I added a few levelers to my cabinet to help dial in the bench top with the surface of my table saw. It’s also a good idea to keep plywood off of a concrete slab for moisture reasons. I used 1/4-20 carriage bolts, a 1/4-20 nut, and threaded inserts for my levelers. With scrap plywood and some 2x4s, I built up a block at the inside corners of the toe-kick to secure the threaded inserts into. 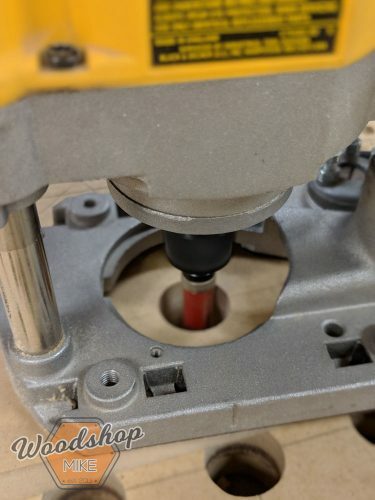 Drill a hole for the threaded insert, install the insert, and then run your bolt with nut into place. 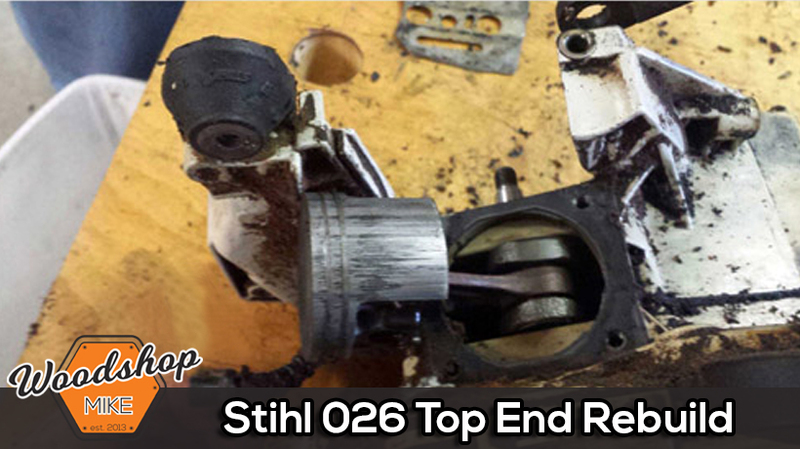 The nut is used to lock the position of the bolt and help mitigate slop in the threads from letting the table shift. With the required pieces cut, I follow the layout in my plans to guide assembly. The frame is put together with glue and brads like much of the project thus far. From here, I head over to the drill press and cut a hole in the bottom sheet of luan for the 4″ duct take-off. 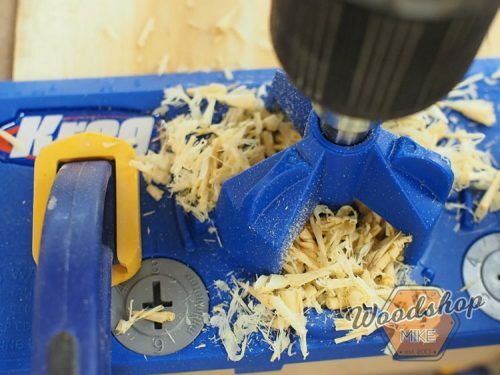 If you don’t have a circle cutter, you can use a jigsaw or router for this step. I center the bottom sheet of luan and secure it to the frame with glue and brads. Then I put in the last two sheets of luan and support them with some small cutoffs of 3/4″ plywood. These pieces are secured with glue and brads. I then install the 4″ duct take-off and run a bead around all the seems with HVAC sealant. Now take your plenum over to the cabinet and install it as shown in the plans. 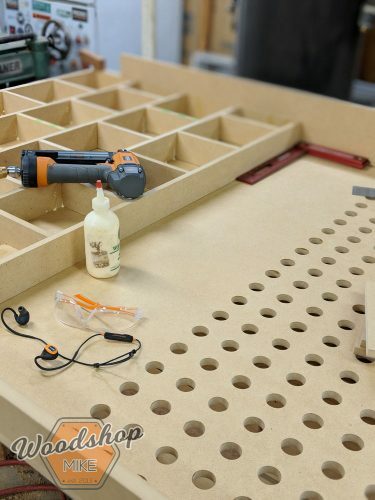 Take care to make the top surface of the plenum flush with the top of the cabinet case. You should be able to just secure it with glue and brads, but if your plywood is bowed like mine was, don’t worry. 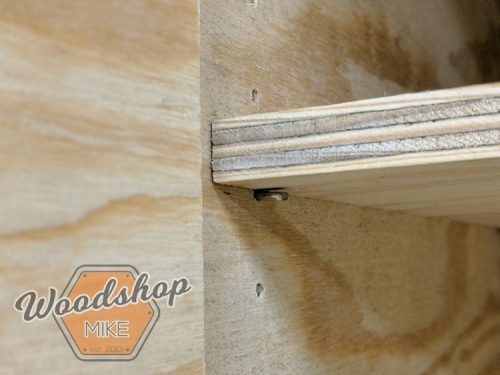 Just countersink a few holes and run some #8 x 1-1/4″ screws through the cabinet into the plenum frame. Now you’re going to want a buddy, spouse, strong kid, or random stranger outside your shop to come help with this step. I still had some construction adhesive left, so I went ahead and ran a bead around the top of the cabinet before setting the torsion box top in place. 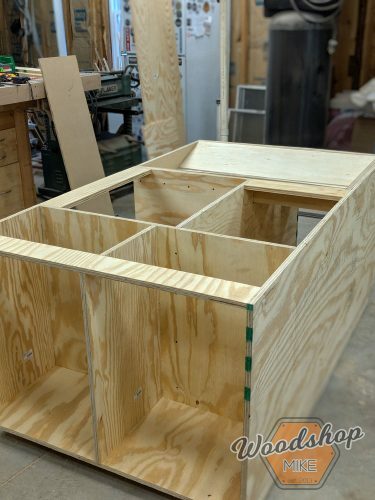 If everything goes according to plan, the plenum and downdraft holes will line up if the top is flush with the back of the cabinet and centered side to side. If you have to adjust a bit and the top isn’t perfectly centered, no sweat. From here, just run a few screws through each stretcher into the top and you’re golden. With the doors cut to the correct size, I simply positioned the Kreg Concealed Hinge Jig, drilled the holes, and installed my hinges. I’m not sure how that could have been any easier! You can measure for the location of the mounting plates that go in the cabinet and install them separately from the hinge, but I typically use a different approach. 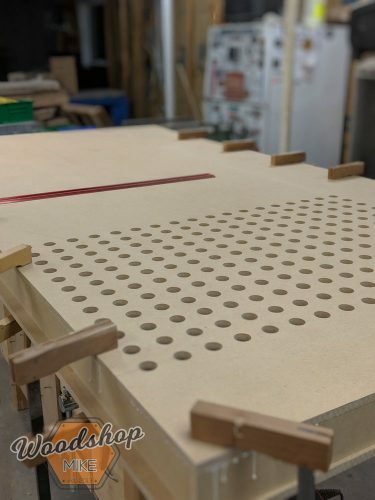 I just scribe a line 1-1/4″ back from the cabinet face, prop the door in place with my foot or blocks, and drive screws through the mounting plate holes once everything is lined up. I aim for a consistent reveal and then adjust the hinge screws for final tuning. 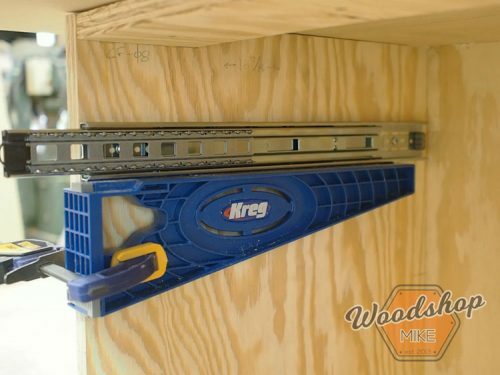 With the shelf cut, it was time to break out another jig by Kreg. The Shelf Pin Jig is pretty awesome, and as you would expect, it’s easy to use. I measured for the location of the bottom edge of the jig and clamped it in place. I made sure to have the edge guide fully seated at the front of the cabinet. After drilling all of the holes at the front of the cabinet, I moved to the back of the cabinet and removed the edge guide. Here I simply held the jig at my measurement for the first hole and then placed the locating pin in the first hole and drilled the remaining locations. If you wanted this to be even more accurate, you could cut a stop block to rest the jig on. Even without a stop block, I was thrilled that this step only took about 10 minutes and all the pins were so accurately drilled! 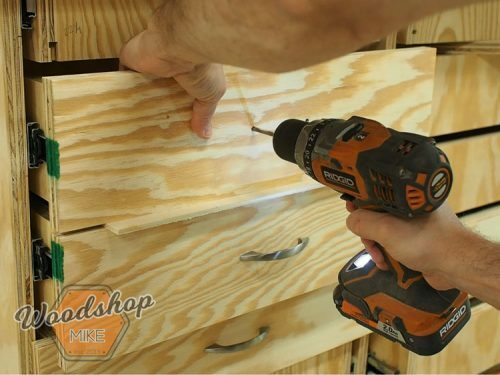 There are tons of ways to build drawers that are quick and easy, so if this approach is a little outside of your comfort zone, then feel free to change things up a bit. With the way I optimized my sheet layout, I first ripped down my stock to the length of each drawer piece. Then I set up my saw to cut the height of the front, back, and sides for all of the drawer pieces. 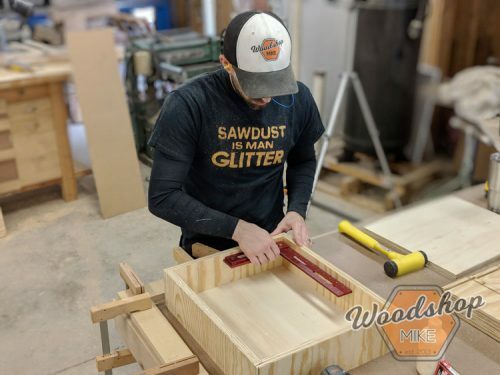 A crosscut sled makes this second series of cuts much safer, so break that out if you have one. The joinery I use is known as a locking rabbit. Simply put, you cut a dado in the sides and a rabbit on the front and back. 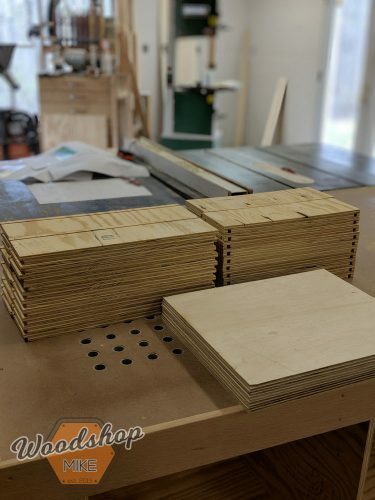 All of this can be done on the table saw and you don’t even need a dado stack! To secure the bottom of my drawers, I cut a dado that’s 1/2″ from the bottom on all four pieces of the box. To assemble the drawers, I first set up a jig made from two pieces of scrap MDF clamped at 90° on my bench. These are used to hold the box square as they are nailed together. Grab a front and add some glue to the dados for the sides. 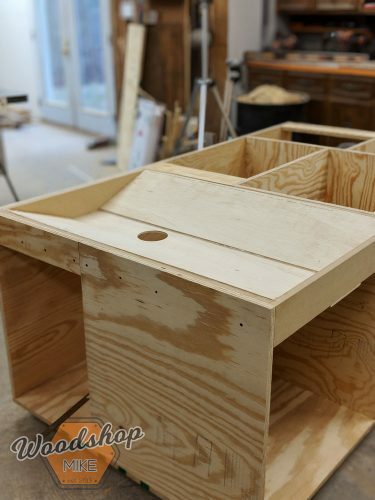 Grab two side pieces and install them using the dado for the box bottom as a reference to correctly orient the sides. Next up is the drawer bottom. Just slide that puppy in place. The last piece to add is the back. Again, add glue to the dados for the box sides, line it up, and press the joints together. You may need to use a mallet to persuade the box together, but don’t get carried away. With the joints fully seated, set the box against your 90° jig and make sure there are no gaps between the box sides and your jig. Now, take your square and check the opposite corner for square. Once everything is lined up, throw a few brads from the front and back into the sides of your box. 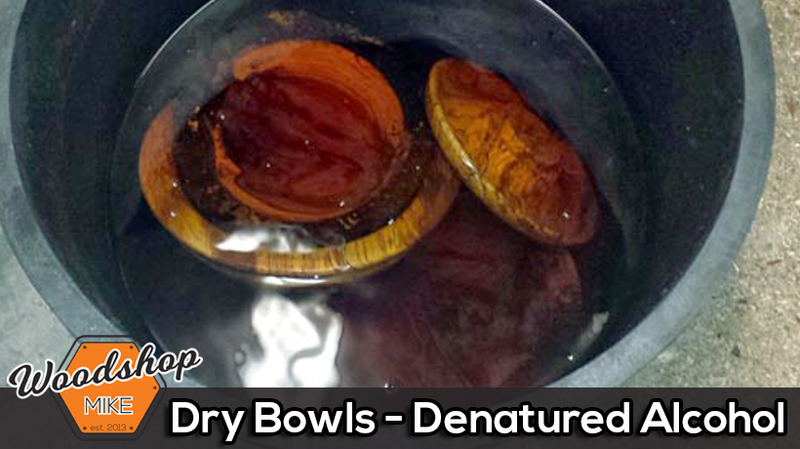 Since the glue is still wet, pick these up with a bit of care and set them aside to cure. Carry on through the rest of your boxes and you’re good to go! 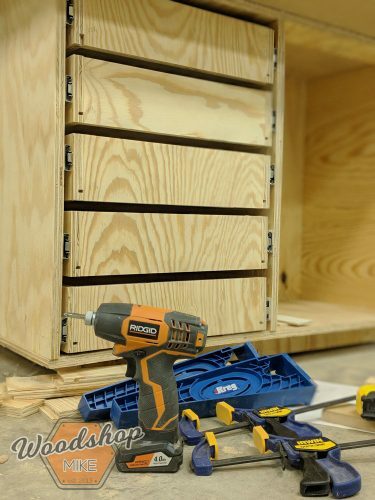 I used yet another Kreg jig for installing the drawers in this cabinet. 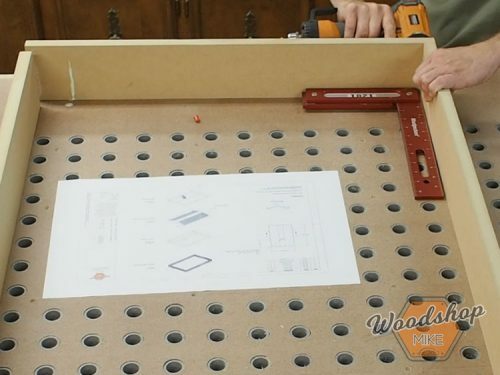 The Drawer Slide Jig is another tool that just makes shop projects easier. 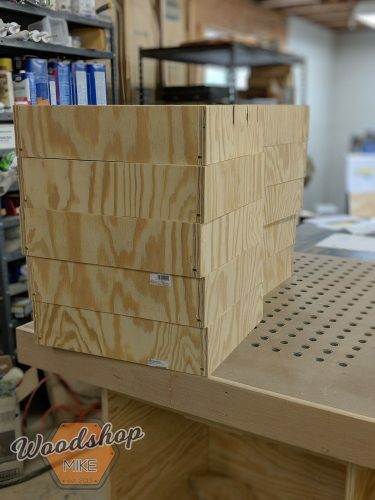 I marked for the bottom of each drawer slide on the inside of my cabinet frame and simply aligned the top of my jig with each mark. With the edge of the jig seated against the front of the cabinet, I clamped the jig in place. Remove the drawer portion of the slide and set it aside. 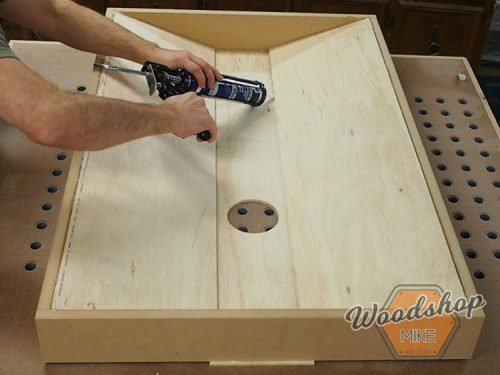 Place the cabinet portion of the drawer slide on top of the jig and secure it with three screws. Repeat this process for the opposite side of the drawer box. Then repeat this process until all of the slides are installed in the cabinet. 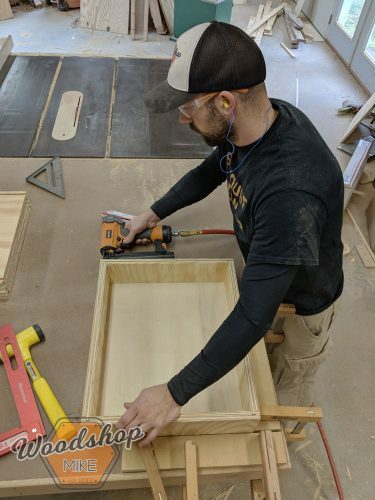 Next, reinsert the drawer portion of the slide and set the first drawer box on a 1/4″ spacer in the bottom of the cabinet. This will provide clearance for the bottom of the drawer box and prevent it from dragging in the cabinet. Pull the box out about 4″ and align the front of the drawer slides to be flush with the front of the drawer box. 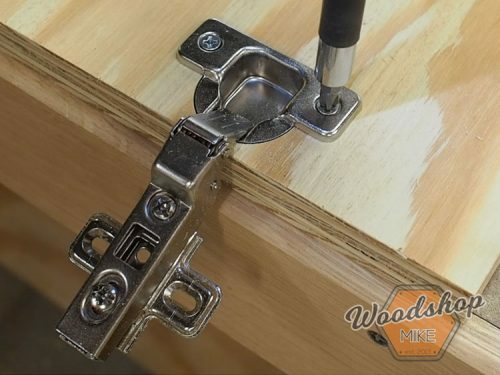 Drive a screw into the first hole of the left and right drawer slides, pull the box out a bit more, and drive a screw into the middle hole of the drawer slides. 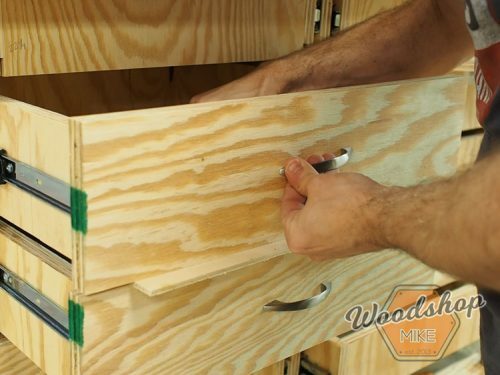 Finally, remove the box and drive a screw into the last holes on each of the drawer slides. Reinstall the drawer box and repeat for the remaining drawers. I set spacers on top of each previously installed box to set the required gap between each box and to locate the drawer glides correctly. Check the plans for this spacing layout. The drawer fronts are cut from a single section of plywood to create a continuous grain pattern across all of the drawers. I drilled all of the holes for the handles on the drill press using stop blocks for speed and consistency. I started with the bottom drawers and clamped them in place according to my plans. I drilled through the drawer box using the holes in the drawer front as a reference. Then I simply secured the handles with the two provided screws to hold the front in place. If you want some extra holding power, just run some #8 x 1-1/4″ screws from the inside of the drawer box into the drawer front. For subsequent drawer faces, I used a scrap of luan to create the spacing. Just set the luan on top of the previous drawer front and hold the next drawer front in place. Line up the edges and drill the two holes for the handles. Install the handle, double check that nothing has shifted, and repeat until you’re done! 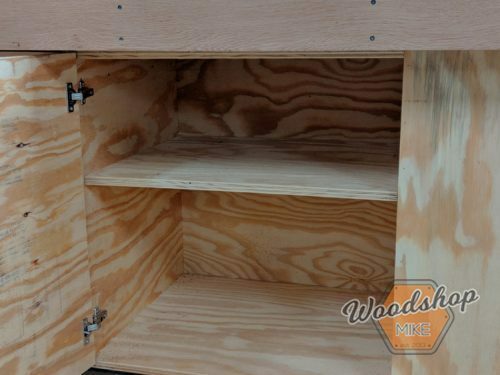 The back cabinet is intended to hold a small 1-2hp dust collector to provide dust collection for the downdraft section. I have mine hooked up to my table saw as well and use blast gates to isolate the tools from each other. 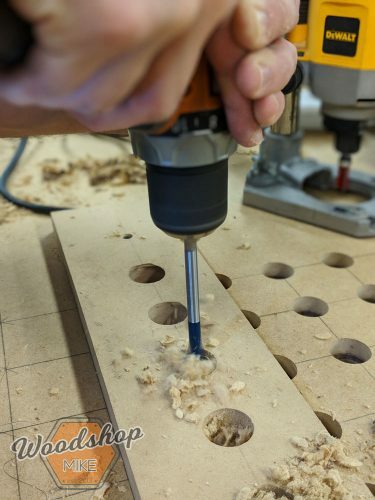 You may have to rearrange your dust collector a bit depending on the model, but you could always drill a hole in the back of the cabinet to run a hose through if you already have a dust collector setup. 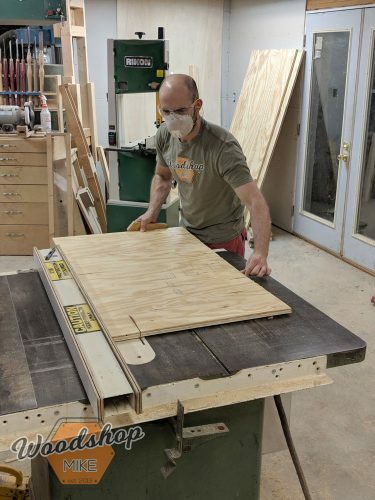 My table saw top is 34-1/4″ off the ground. Depending on the height of your saw, you’ll need to adjust the height of this cabinet to match. I’d recommend either making the torsion box or toe-kick shorter to fit your saw. 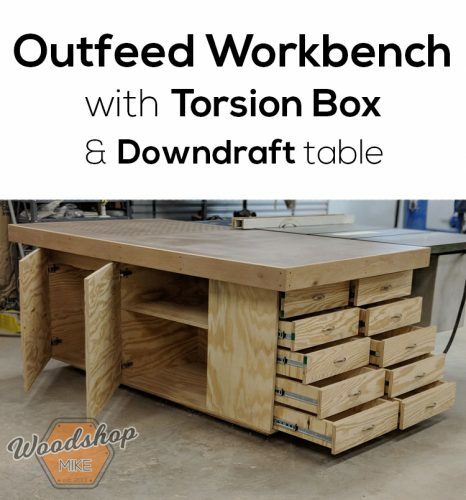 I’d love to hear what you’ve done to make this outfeed table even better in your shop! Home Depot & Klingspor’s Woodworking Shop supplied products and/or monetary compensation as sponsors of this project. All opinions are my own and are not influenced or edited by these sponsors. 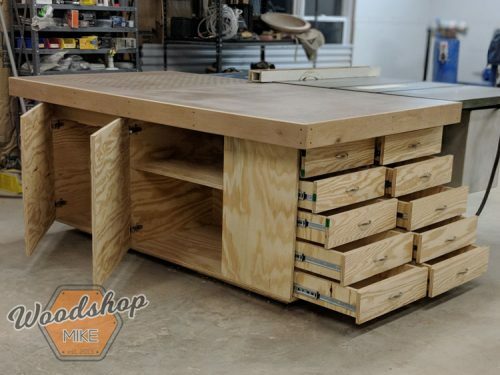 Just building my first shop and know I will need outfeed table. I’ve been looking for ideal table with storage and wit added downdraft end I just found my table to build! Really?! That’s strange as the cabinet and torsion box are all in a single file. Let me look into this and I’ll get you squared away! These plans have been updated! Thank you very much for letting me know and sorry for any inconvenience it may have caused.